The Fender DuoSonic guitar was first produced by in 1956. It was meant to be a student guitar. It featured a short, 22.5 inch, scale length that was considerably shorter than the 25.5 inch scale used on standard Fender guitars. The DuoSonic, which is sometimes spelled as Duo-Sonic or Duosonic, has two, single coil, pickups and a vertical pickup selector switch that is placed on the lower horn of the body. Fender released a new guitar called the Mustang in August 1964. This guitar was an economy model and was designed for student guitarists. This guitar featured a new design of tremolo arm that many guitarists found impractical. 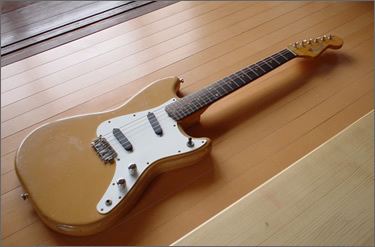 At the same time Fender also release the Duosonic II which had the same offset waist body but did not have the tremolo arm. Fender discontinued the Duo-Sonic II in 1969. This model was only in production for 5 five years. It has become Fender guitar that has a growing collector value due to its rarity and player demand. Many guitar players prefer the Duo-Sonic II to the similar Fender Mustang. This is because they prefer the more practical fixed bridge to the Duosonic II as compared to the troublesome tremolo bridge of the Mustang. The Duo-Sonic is closely identified with Liz Phair though it was used by David Byrne of the Talking Heads early in their career as well as Jimi Hendrix (when he toured the under the name Jimmy James with The Isley Brothers). Johnny Winter also used a modified Duo-Sonic during the late 1960s and early 1970s, particularly on his first few albums. Patti Smith also plays a Duo-Sonic and has featured her guitar in song lyrics, for example in â€œRadio Ethiopia/Abyssiniaâ€ from the Radio Ethiopia LP. Tom Cummings from Human Condition uses the late 90â€™s remake Duo-Sonic. The Duo-Sonic I and II are both considered rare and have displayed growing collector value. The Duo-Sonic II in particular is often seen as a desirable alternative to the more popular Mustang, since it negates the difficult-to-maintain tremolo bridge. Fender have recently re-issued very cheap “Squier” version of the duosonic, but original 60’s ones are still available for under $2000. Well worth a look at that price!